Always attentive to customer requests, we are able to customize printouts and procedures based on specific needs. Sell online with a single system: No additional Management work, Personalizable Price Lists and constantly updated Inventory levels. No commission on Sales. In a Bridal Shop, Agenda is the main tool for planning the activities of the entire organization. Thanks to Etos tools it’s possibile to create specific appointments (first viewing, first tyron, etc) divided by consultant. For each appointment it’s possible to register the customer, the ceremony date, the type of contact and any notes on the type of ceremony and location. In each card it’s possible to enter the pieces tried on in the changing rooms, and also provide a personalized estimate upon request. Manage all the aspects of the sale in one screen: from entering customer data to the entering details about dresses plus accessories, including customizations and changes to be made. It is also possible to record the first deposit and specific accounting cards will handle subsequent payments. When the sale is over, it is possible to print the contract containing the following information: detail of product purchased, total amount, deposit paid with balance, any try-on appointments and finally contract clauses and acceptance signatures. Once the sale has been completed, it is possible to print the contract containing the order information: detail of products purchased, total amount, deposit paid with balance, any try-on appointments and finally contract clauses and acceptance signatures. From the Etos Customer Card you can quickly and automatically manage all those operations that follow the sale, such as verifying the status of items per customer, the accounting status with payments and balance, and the engagements set. Finally, it is possible to perform a “reorder” operation to supplier. With Etos you can manage the relationships with your suppliers: load your Purchases in a quickly way or by importing from an Excel file. As far as managing “Reorders” is concerned, the automated procedure scheduled in the “Customer card” will enable you to simplify, speed up and summarize each single supplier reorder. The Tailor Shop Module includes the possibility of creating specific tables by Tailor or Seamstress, Model type, kind of work and, furthermore, a cost and a sale price can also be linked to each of these combinations. Obviously it is also possible to enter custom information about the type of work, time and costs. 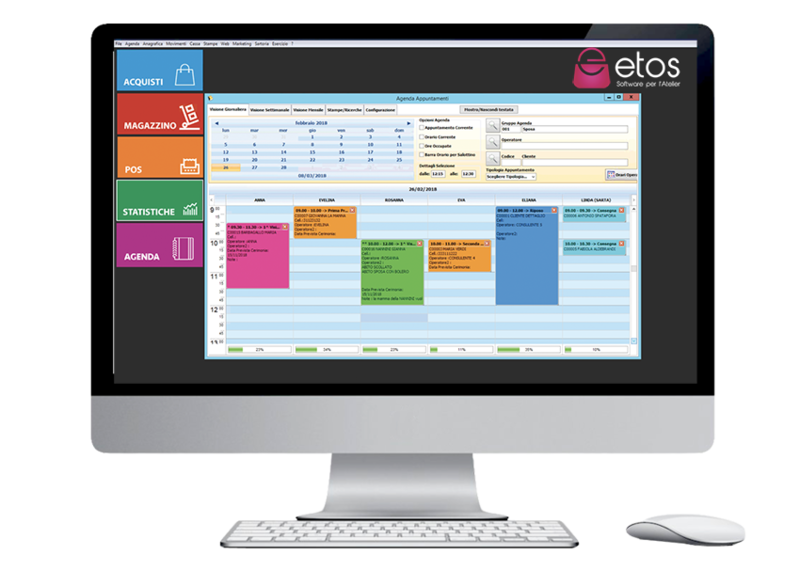 With Etos you can quickly consult specific information for any combination you need. Over time we have created specific reports for the Bridal Shop business such as: Analysis by consultant, Analysis of customer credits, Cash Payments and Withdrawals, Summary of activity per salesperson, sales’ Summary, Analysis of Profitability, Sales printout.